Check out our adorable Fairy Garden Cake. 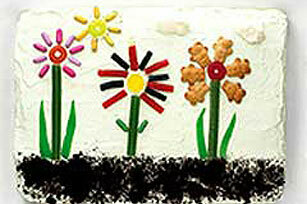 Perfect for springtime, decorate this Fairy Garden Cake with cookies and flowers to form cute flower shapes. Prepare cake batter and bake as directed on package for 13x9-inch pan. Cool cake in pan 5 min. ; remove from pan to wire rack. Cool completely. Tint COOL WHIP with food coloring. Spread over cake. Decorate with remaining ingedients to resemble photo. Prepare using your favorite flavor cake mix. For easy removal of cake, turn empty pan upside down; press sheet of foil down around all sides. Turn pan over; place molded foil inside pan. Pour batter into prepared pan and bake as directed. Practice mindful eating by savoring the flavor of this decorative cake and sticking to the recommended serving size.